Lucite – 2018 saw the biggest ever overhaul of Lucite International’s (LI) Cassel plant at Teesside in the UK. Over three and a half years in the planning; costing in excess of £17 million ($20 million); and involving over 1,000 contractors, this year’s overhaul took place in March, just as the worst winter weather in living memory hit the UK. Andy Brothwood, Cassel’s Overhaul Manager explains the challenges of 2018 and the commitment to Cassel’s long-term operational capability, demonstrated by MCC’s ongoing investment in the plant. Pictured: the old Cold Re-Heat Exchanger being removed from its berth on the sulphuric acid recovery (SAR) plant. LI’s approach to overhauls at Cassel is constantly evolving. Since becoming Overhaul Manager in 2014, Andy Brothwood’s intention has always been to develop the way the business approaches and thinks about its overhauls. The sign on his office wall reading “If you always do what you have always done, you will always get what you have always got!” neatly summarises his philosophy of the need for continuous improvement. Consequently, for the 2018 event a greater emphasis was placed on the overhaul preparation phase than ever before and specific owners were allocated to drive improvement in key areas (SHE, Quality, Training, Operations, Planning, Infrastructure etc.). A planning tool was used to develop all of the “job method sheets” and plans required. This system details all of the resources, materials and equipment required to deliver the scopes of work. An application was then utilised to build the main work schedule and identify the critical path activities and resources required. The results of this intensive pre-planning speak for themselves. Cassel’s safety performance for the 2018 event was excellent, delivering some of the best safety figures over the last 15 years with zero reportable injuries; zero dangerous occurrences; and zero reportable environmental incidents or occupational health illnesses. Andy attributes this improved performance to an increased focus in the preparations phase and also the development of specific SHE improvement themes. The approach taken was to allocate each theme an owner, and then to assemble a team whose aim was to deliver improvement in each of their areas of accountability. As a result, each team delivered an improved performance in each of these key areas, which clearly demonstrates the power of this comprehensive team approach. As well as executing the standard maintenance and defect work, the 2018 overhaul was dominated by major project works with the installation of a number of large strategic projects. 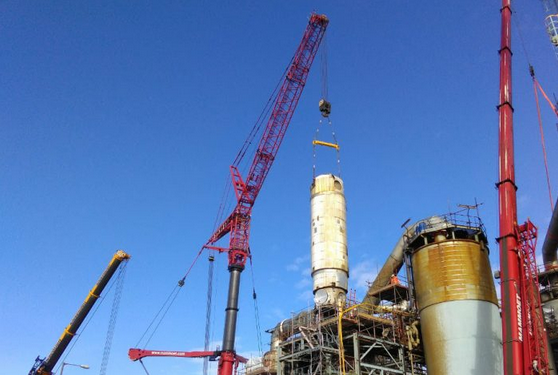 Because of the size of the overhaul, a new approach had to be developed for the organisation to be able to safely manage and deliver the work scope in the given time frame. Andy acknowledges the potential ‘fatigue factor’ problem when you deliver an event of this size over such a long period, with the team often working long hours day after day. Overhauls are always intensive but undoubtedly the most challenging aspect of the 2018 event had to be the adverse weather conditions. Historically overhauls at Cassel have always been scheduled during September-October. Staging the event in March was a first and, ‘as luck would have it’, the UK experienced some of the worst weather conditions in living memory during this period. The so called “Beast from the East” storms arrived in the UK over the course of the overhaul, making life on site very difficult indeed. The safety implications that this type of weather front brings are huge and the overhaul management team had a real responsibility to make sure that it put the safety of people before completion targets, constantly reminding themselves that the number one objective was to get “everyone home safe every day.” With the weather compromising the team’s ability to execute the work on schedule, and the programme slipping further and further behind, morale was inevitably affected. However, faced with adversity Andy says that the feeling of camaraderie was strong and the whole team dug deep and put in an incredible amount of hard work and effort to minimise the impact of the weather conditions, working tirelessly to regain lost time. When times were toughest, supplies of biscuits, fish and chips, pies, sweets and a good sense of humour helped to keep the spirits up and provided the required energy boost to get people through the long days! In total Andy estimates that approximately 12 days were lost due to the adverse temperatures, snow and high winds and the resultant cost impact on the budget was around £1.2 Million.